Highlights from the inaugural NursePitchTM event in Orlando. THIS JANUARY, the American Nurses Association (ANA) announced a new partnership with the Healthcare Information and Management Systems Society (HIMSS) to advance nurse-led innovation. HIMSS is a global, cause-based, not-for-profit organization focused on better health through information and technology. This relationship fosters a unique opportunity to harness a role for all nurses as innovators, entrepreneurs, informaticists, and tech enthusiasts. The collaborative partnership aims to drive nurse-led innovation through cobranded initiatives, including NursePitchTM events. HIMSS and ANA representatives present Sangeeta Agarwal with the first-place award for her innovation, Helpsy. 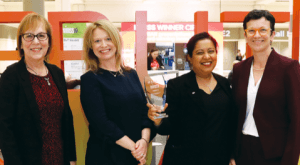 Pictured from left: Joyce Sensmeier, Christel Anderson, Sangeeta Agarwal, Bonnie Clipper. Karen Tilstra, PhD, cofounder, Florida Hospital Innovation Lab. After the panel discussion, each finalist had 5 minutes to pitch his or her innovation and then 5 minutes to answer judges’ questions. After the pitches were completed, the judges huddled to compare notes and determine the winners, who were selected and announced at the event. Undergoing cancer treatment is financially challenging and physiologically and psychologically stressful, and it has a profound impact on all dimensions of life. Helpsy provides a symptom management and naviga- tion platform to support cancer patients throughout treatment. My Resource Assistant (MyRA) efficiently addresses staffing shortages to alleviate the negative impact on patient safety and care. Healthcare systems are designed to help patients get well, but success is difficult to maintain when a patient’s whole picture includes unmet social and behavioral needs. New Trails Navigators improves the health of communities with Peer Patient Navigators. The innovation scholarships were made possible by the HIMSS Foundation. Winners also will have the opportunity to participate in mentorships to advance their innovations even further and will be featured in a series of articles and blogs. The next NursePitch event will take place at the ANA Quality and Innovation Conference (QICon) in Orlando on April 26. The theme of this event is digital solutions to transform care delivery. Visit nursingworld.org to read about NursePitchTM and learn more about the ANA and HIMSS partnership to advance nurse-led innovation. I am the Director of Innovation & Outreach for MUSC. Please forward more articles, course offers, certifications, seminars, CEU’s etc.